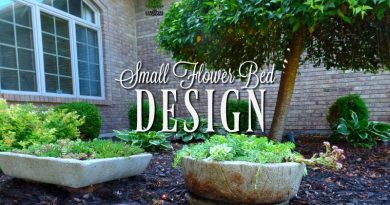 Large Trough Planters are tough to make! We really found that out a few weeks ago when I got together with my daughter and my husband and we tried making a whole bunch of hypertufa pots in a marathon hypertufa-making session. It was pretty much chaos and I was trying to film it all. What a mess! This is the first time I tried a GoPro to film. My daughter had it on her head with the GoPro headstrap. My daughter shares my love for hypertufa and it is nice when her work schedule and the weather co-operate and give us a day when we can make a whole lot of planters together. On this particular day, it all worked out and we set everything up and we were good to go! I have an electric cement mixer and when we are in the mood to go into “mass production,” this is what we use. I don’t have the best set-up in the world and I will need to consult next time with my daughter and get this thing organized. My cement mixer is very old, but when it quits on me, I WILL get a new one. 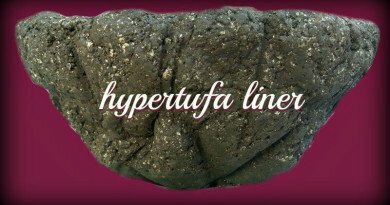 Remember, I am Addicted to Hypertufa. When I try to film AND use the electric mixer, it is just chaotic. Hoses, extension cords, containers, plastic……Yeah, it is slightly unorganized. Both my daughter and I wanted some large planters. 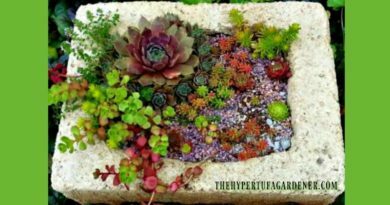 I have been gradually favoring the larger hypertufa planters since I can plant more succulents in the same trough planter and just let them spread. Some of my sedum ( such as Coral Carpet) really grows well and gets wider and larger and cascades. And it blooms nicely too! Same with the Sedum sexangulare. I have so much of that too! See my Succulent Index page for more suggestions. I have also started to only drill one hole in the center of the posts. I think it helps it to retain more water during the dry spells. Since I have a lot of my hypertufa on gravel and on the deck, they tend to heat up and lose moisture quickly. So I think one hole in the bottom for drainage is enough. 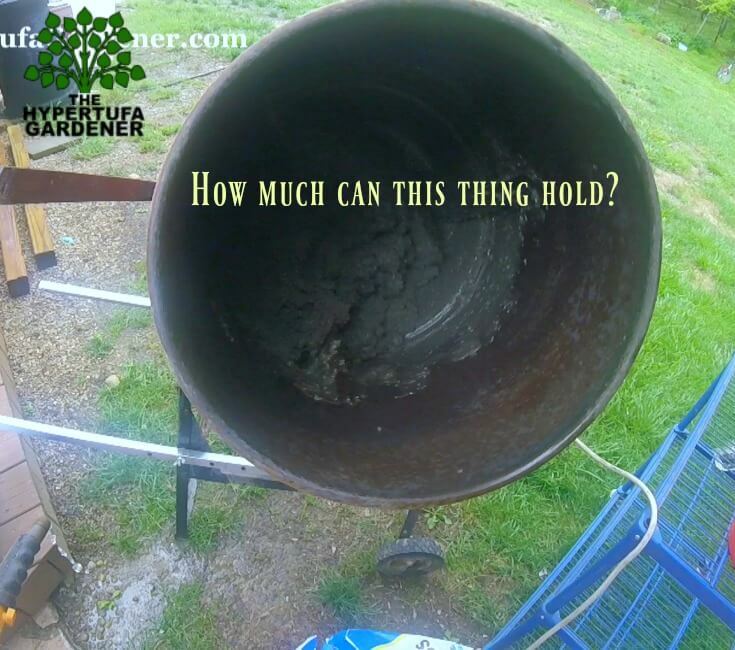 What will go into my new large hypertufa? 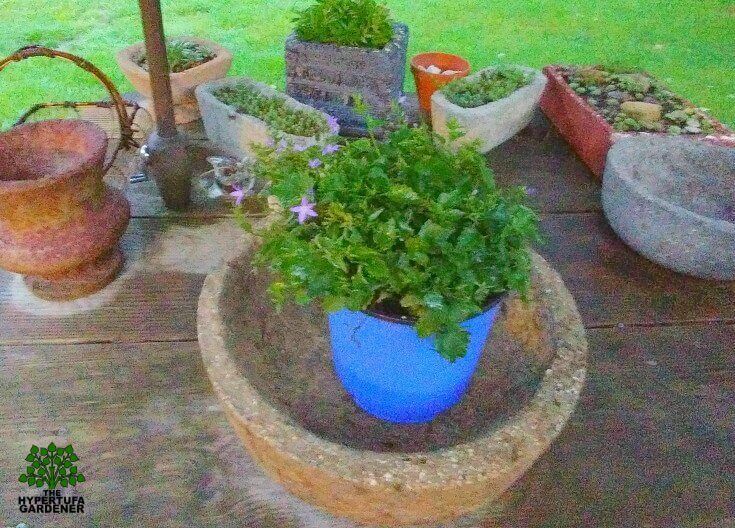 I got a special deal on some clearance perennials at Lowe’s , so this is the plant I chose for my newest hypertufa bowl. 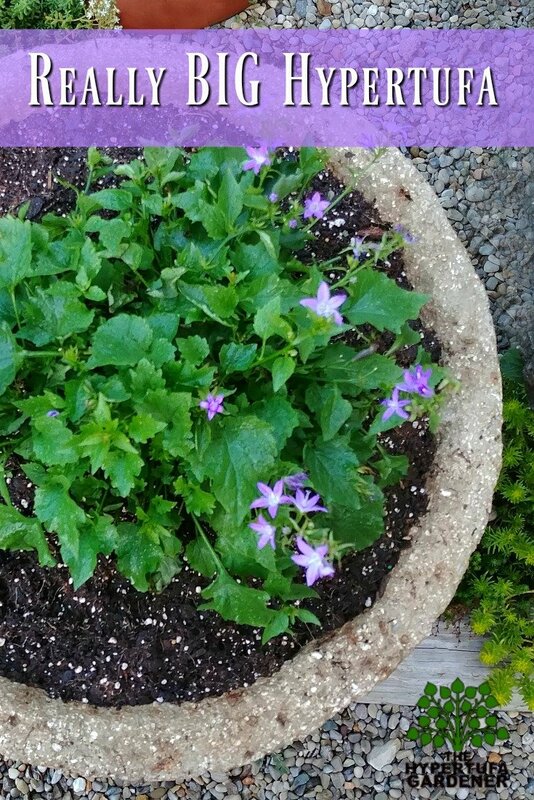 It is Campanula poscharskyana “Blue Rivulet” ( also known as Serbian Bellflower) and it is supposed to only get 4-7 inches tall, mounding and trailing, so it will be perfect. I have had this plant previously and love it. If you keep it deadheaded, it blooms most of the summer. 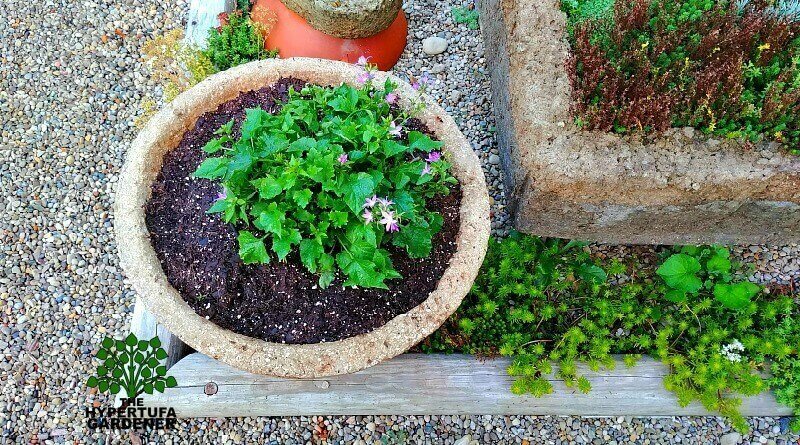 I have filmed another video of the planting up of this hypertufa bowl and I hope to have that ready shortly. 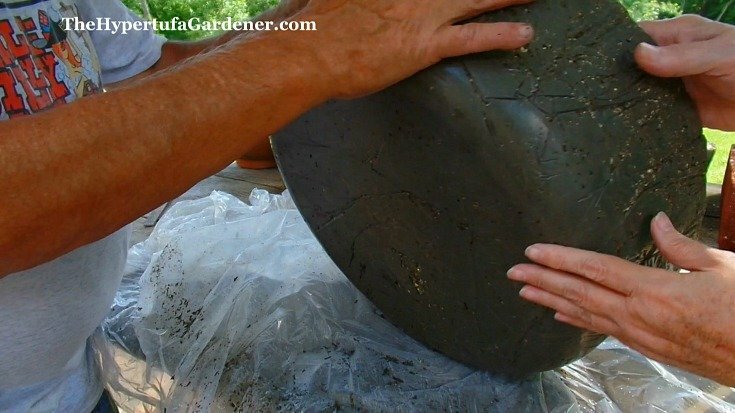 But meanwhile check out this video and watch us make hypertufa pots. It is fun playing at making “mud pies” with my daughter. Love it! Thanks for stopping by and reading my blog. I hope you like the video and will Pin and Share. It helps me more than you know! Check out all my other videos too. I have a lot of basic info for beginners and for those who have experience. ← A Newbie With Knock Out Roses Surrenders To Shovel!